As ‘THE BEN BERNANK’ Is Losing Control Of The Long-End, Will Vigilantes Push ‘THE BEN BERNANK’ To Act On The Short-End? So what exactly is the Ben Bernank doing? 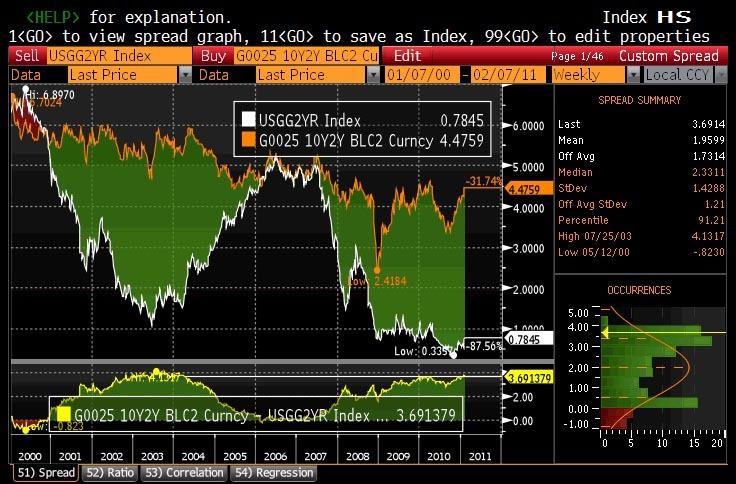 While it is well-known by now that Bernanke is slowly but surely losing control of the long-end of the curve, and increasingly more so the 10 Year (3.66%) and the belly itself, little has been said about the short end, which is where the bond vigilantes get to say a thing or two about future QE. And just like last year, when the 2 Year surged to over 1% in Q1 and early Q2 before it was made clear that the Fed’s first attempt at pulling out of the central planning business was a failure and required the gradual reintroduction of yet another quantitative easing episode, so now the 2 Year is starting to slide rapidly higher in what is becoming an identical replica of last year’s episode. If that is indeed the case look for the 2 Year to close March just wide of 1% and to peak at 1.2% in April before the wheels fall off in the latest attempt to extricate the Fed from the US economy, and we get a QE3 announcement some time in May. Yet what is even more important than spot levels, are 2Yr10Yr forwards. 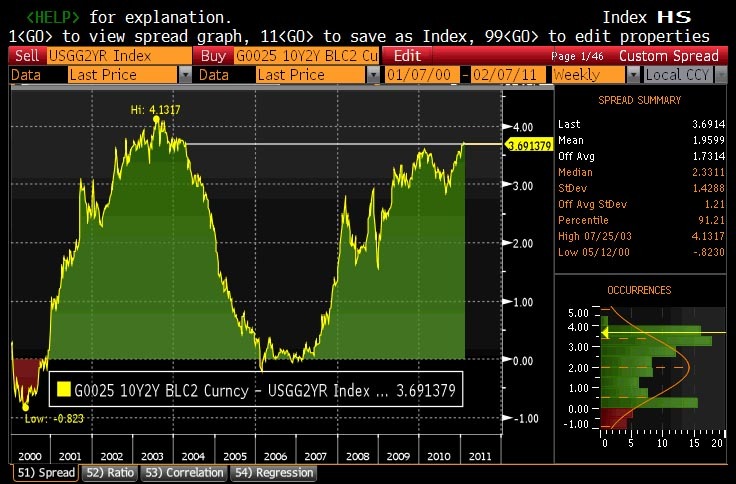 As the chart below shows, the spread has just jumped to 3.70%, taking out previous recent early 2010 highs (yes, when the 2 Year spot was trading north of 1%), and is all the way back to levels last seen in 2004, when the Fed was actively in the process of deliquifying markets. Is the forward curve telling us it is high time for the Chairsatan to finally do the right thing? And if not the case, is it time to put on a convergence trade between the spot and the 10 Yr forward? 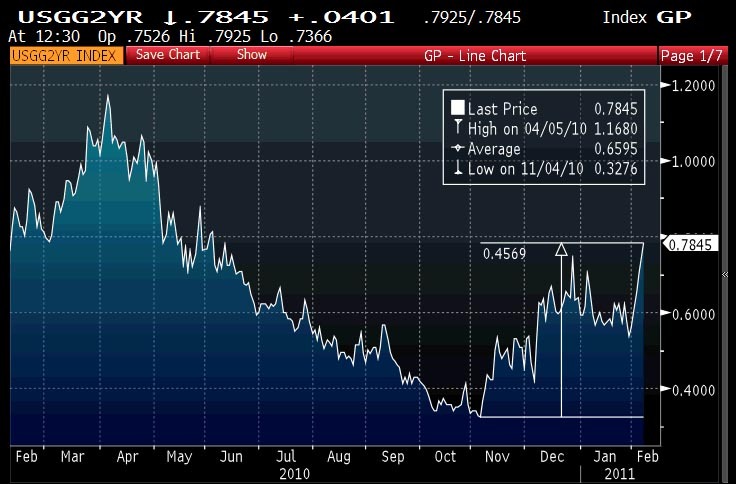 And as a reminder, the last time the spot-fwd spread was so wide, it was the 2 Year which moved almost in a straight line from 1% to 5% in just over 2 years. Of course, what happened next, we all know… and so does the chairman. Which is why anyone harboring dreams that there is any even modestly remote chance that short end yields will voluntarily go higher, should reevaluated their thesis.